Wishing you a bright-eyed and smile-filled week! More Marta Beast? Here and here and here. 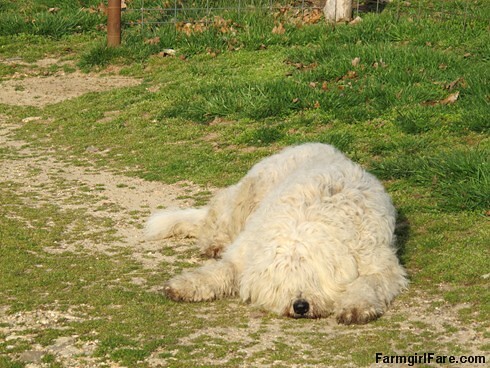 © FarmgirlFare.com, the 20/20 foodie farm blog where five-year-old Marta is a 100+ pound mix of three livestock guardian dog breeds: Great Pyrenees (which is what her seven-year-old partner Daisy is), Komondor, and Anatolian Shepherd. She's also 100% goofball—and in desperate need of her spring spa day/shearing (or at least her bangs trimmed). She is an awesome guard dog and we love her to pieces. I cannot believe she is 5! Wow, time flies. Susan, how does she ever see out through those bangs? Also always wondered if you can play with the livestock duo, or are they really just tuned to the flock? ADORABLE picture! Man she's cute. Love those mutt combos. Could I bury my face in her fur and just inhale for a week or two until I have had my fill of lovable dog scent ?~! Sweet-looking and soft as cotton, she appears to me. Such a sweet precious fur baby. How adorable. But you do have lots of cute fur and feather babies. Hi new to your cute blog. I have a Great Pyrenees and, while I know they always come up looking white, they do get incredibly dirty and matted. Do you do any grooming with these dogs (and if so, when do you find the time?! )or just let them go. We're in the bush and I'd love to be able to just leave ours the way she is. I also have collies; they definitely need twice a year grooming in a very understanding salon! Apologies for the delayed reply. Daisy is really good about getting herself clean and shedding off her winter coat each year, but one of the main reasons I bought her was because she isn't nearly as fluffy as many Great Pyrenees I've seen. Marta, on the other hand, is a mess. :) By some miracle she looks nice and (almost) clean and fluffy in this photo, though it must be some trick of the light. She is in desperate need of being totally sheared. We bought a set of pro animal clippers but haven't used them on her yet. I did cut a lot of her matted fur by hand. She's really only bad on 1/3 of her body - she's a tri-cross and it's like she literally has three sections of different coat. She fortunately cannot see Monday'coming ;) What a big sweetie! !